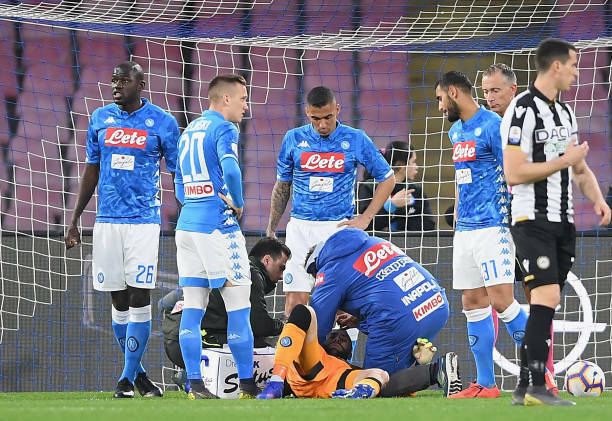 Napoli goalkeeper David Ospina has been placed under observation for 24 hours in hospital after collapsing on the pitch following a knock to the head earlier in his team's 4-2 Serie A win over Udinese, his team said on Sunday. The Colombia international received treatment after colliding with striker Ignacio Pussetto minutes into the game at the Stadio San Paolo. The 30-year-old, who is on loan from Arsenal, was treated on the pitch but later returned to play with bandages around his head. But 41 minutes later, Ospina collapsed to the ground as medics rushed on, with the player stretchered off and transferred to the nearby San Paolo hospital in an ambulance for tests. "Fortunately it's nothing serious, he's conscious, they did a CAT scan that is negative, he'll remain under observation tonight," said coach Carlo Ancelotti. "Ospina will be transferred in the next few hours to the Pineta Grande Clinic where he will stay under observation for the next 24 hours," the statement added.